Great location: a block and a half to Oak Bay Ave with cafes, Red Barn Grocery, etc. 5 minutes to Gonzales Beach, 8 minutes to downtown. Sunny, bright main space. Three bedrooms: a king-sized bed, a single, a bunk (with queen on bottom). Back deck with pallet furniture, picnic table and benches and BBQ. Backyard with spring free, netted trampoline (use at your own risk - please zip up zipper - no shoes please). Parking available. Transit and shared bike and car systems nearby. You will enjoy our beautiful home and modern living space as if it was your own. The area is filled with other character homes and our house even offers a tire swing out front. 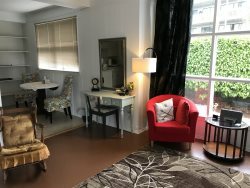 Our place is perfect for a family visiting Victoria for the summer months, working individuals who wish to be in a quiet yet lively part of town or for couples looking for some quiet time and somewhere to enjoy some rest and relaxation. Three bedrooms, living-dining-kitchen main space, bathroom. Front yard with tire swing. Back deck. Back yard with trampoline (use at your own risk, no shoes, zip up net when using). We like to give our guests space. But we can easily be reached through our concierge service. No smoking or pets on the property. No parties or drug use allowed. No shoes inside the home. Please respect our home as if it was your own. Please be quiet and respectful of neighbours when outdoors, and please move inside after 10:00pm.